Can you imagine Vinayakar chaturti without gorgeous tempting kozhukattai’s!! !its beyond the bounds of possibility.To me this coconut kozhukattai recipe is so much close to my heart! !I love the soft outer layer and the sweet coconut filling!combined gives a taste that feels totally out of this world!really. 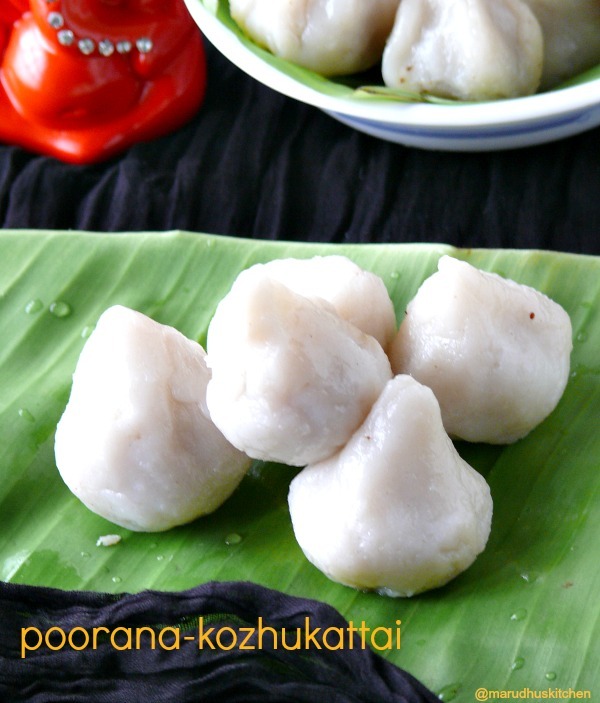 The very same kozhukattai has different names in different regions and a wide varieties and stuffing can be done using this single versatile ingredient! !the rice flour.Iam eager to make ukadichi modaks but this time I could not make it and present you with step by step instructions!for sure I’ll make one next time.The rice flour dough for coconut kozhukattai recipe should be stretched and combined with some oil so that we get soft kozhukattai. 1.Add jaggery with few tablespoons of water boil and filter the impurities and keep ready. 2.Add little ghee in a kadai and add coconut and fry for some time. 3.Then add the syrup and combine for some time,add cardamom,combine and switch off. 4.And leave it for cooling. 5.Now boil water in a kadai with little oil and when its boiling add flour and mix well till combined. 6.Transfer it to a plate and When it is warm add oil and knead well to a smooth dough and keep covered. 7.Now take a ball press down the corners and in the middle evenly and place a small ball of filling and join dough together so that it tappers at the end. 8.In between boil water in a idli pot and When all are ready steam it for 5-7 minutes. 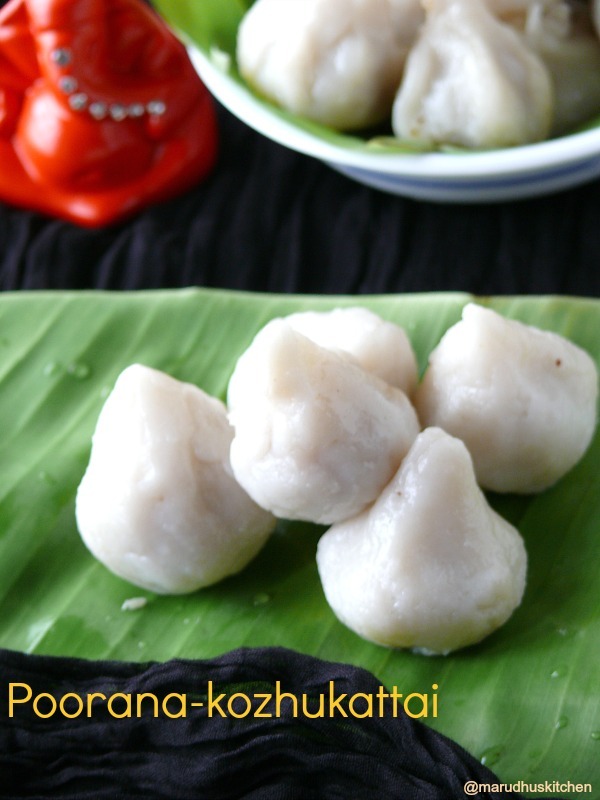 9.Gorgeous tempting kozhukattai’s are ready for ganesha. Add jaggery with few tablespoons of water boil and fitler the impurities and keep ready. Add little ghee in a kadai and add coconut and fry for some time. Then add the syrup and combine for some time,add cardamom powder mix and switch off. And leave it for cooling. Now boil water with little oil in a kadai and when its boiling add flour and mix well till combined. Transfer it to a plate and When it is warm add oil and knead well to a smooth dough and keep covered. Now take a ball press down the corners and in the middle evenly and place a small ball of filling and join dough together so that it tappers at the end. In-between boil water in a idli pot and When all are ready steam it for 5-7 minutes. Gorgeous tempting kozhukattai's are ready for ganesha. Keep the dough covered as it will dry out. Don't saute jaggery for more time as it will harden and go to next stage. By kneading the dough with oil the kolukattai's will be soft and tender. perfect sweet snacks for festivals……looks delicious!